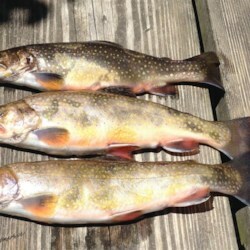 Place each trout on a piece of aluminum foil. Season to taste with salt and pepper, then stuff the cavity with 1 tablespoon of butter, green pepper and garlic if using. Roll the trout tightly in the foil, forming packets. Use some additional foil to secure each packet of fish to a metal toasting rod for use as a handle when removing fish from the coals. Cover the fish packets in the red hot, smoldering coals of your campfire and cook until the fish is done, 7 to 10 minutes, depending on the heat of the fire.